﻿Haridwar, Rishikesh, and Dehradun – Discover India – North India Tour with family. This is more of a holy places tour combined with a nostalgic trip to Dehradun. The famous hill station of Mussoorie is close to Dehradun, that was considered several times during the panning to be visited, but later dropped from the plan. Both Haridwar and Rishikesh are among Hinduisms holiest places. The train journey from Delhi was convenient. This one was a two-tier AC and on the upper deck there was sufficient space between the bed and the roof of the train. I am someone who underwent three surgeries on the nose and I have some condition where I would get claustrophobic that is rooted in the actual turbinate action closing the nasal airway in confined spaces. But because it was sufficiently cold and had enough room between the bed and the roof of the train, I managed to get some sleep, this time. Otherwise put to a birth in the train, I sometimes spend the whole nights without sleep due to the nasal issue and that’s a scare during the travels like these. We didn’t have much time anyway as the train was arriving at Haridwar at 3.52 AM within around four hours. I had to also keep a watch on the arriving destination and wake up the family sufficiently in advance as Joshina and children would be asleep. As the trip was planned to all possible detail, travel and hotel tickets booked prior, the movement was relatively easy. We reached the railway station on time and took a rickshaw to the nearby Sun Hotels. Hotel was good, and we went onto sleep for some time before going to see some spots. Haridwar and Rishikesh are nearby cities of the same nature while Haridwar is a bigger city. Both these cities in Uttar Pradesh are on the banks of the holy Ganga river. We went to the Manasa devi temple through the Ropeway as the first visit in Haridwar. There was a lot of crowd but we managed Darshan in about 30 minutes and came down the hill that Manasa Devi temple is situated in. On the way to the temple, there was lot of shopping available and the family did indulge in some shopping there. After that visit, we moved to Saptrishi Ashram. This is a peaceful place in the busy holy city of Haridwar. It has a lot of trees in the compound. Most of them are mango trees. If you want to go to a calm place in Haridwar, head to Saptrishi Ashram which is some distance away from the heart of the city. From Haridwar, we went to Dehradun for which city I have some personal connection as the city I first visited in North India following the selection to one of India’s largest IT company Hindustan Computers Limited in 1989. The travel was by bus and it took almost one hour thirty minutes and again due to the afternoon time and relative hot climate, we all became quickly tired. Road was quite poorly maintained and there were major traffic snarls on the way due to some ongoing infrastructure work. I felt that the country needs to do much more on the infrastructure as the road was so bad even between tourist circuits like Haridwar and Dehradun. 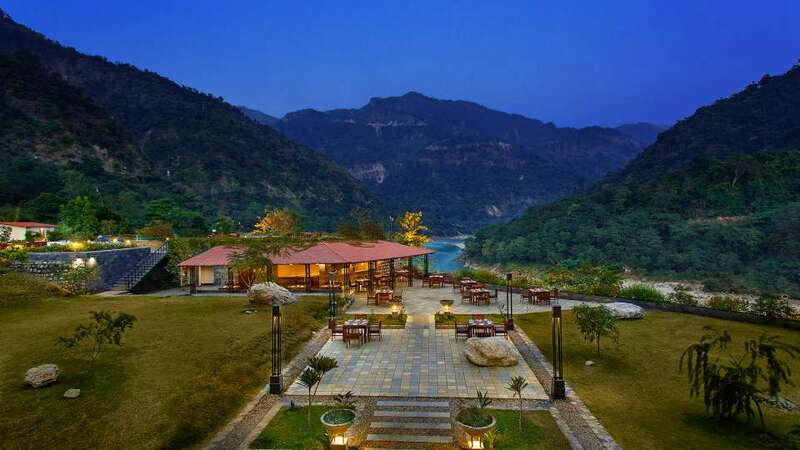 Dehradun has many places of attraction, if you like to visit. Our brief visit consisted of visiting the Forest Research Institute, Doon School where entry was not allowed due to lack of prior approval and the clock tower in the city Centre. Doon school is one of India’s most well-known school where I earlier visited. The campus will be worth a visit especially if you are taking children along. Forest Research institute is a place that you must plan to visit with sufficient time. “The Forest Research Institute is an institute of the Indian Council of Forestry Research and Education and is a premier institution in the field of forestry research in India.” I regretted again due to lack of time that I couldn’t show the place to children well. A we wanted to see the Ganga Aarti in Rishikesh that starts at 6 PM, we had to rush again. We got a bus from Dehradun and reached Rishikesh in more than an hour and literally ran towards the Aarti conducted area in Triveni Ghat. Ganga Aarti is a ritual that is performed in other Holy cities of Haridwar and Varanasi also. “An aarti is a devotional ritual that uses fire as an offering. It’s usually made in the form of a lit lamp, and in the case of the Ganges River, a small diya with a candle and flowers that’s floated down the river”. It is a devotional event that you must witness when you are in town. It happens in few Ghats across in both Haridwar and Rishikesh. One that we witnessed was in Triveni Ghat, Rishikesh. 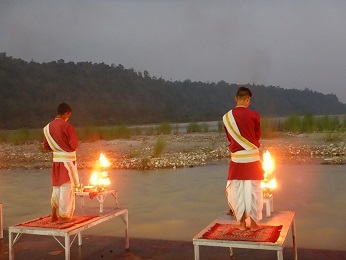 The Ganga Aarti was a very holy event and it witness that in the evening by the banks of Ganga was a great feeling. We spent almost two hours there from 6 PM to 8 PM. The Aarti started at around 6.20 on the day of our visit. I think it was delayed coinciding with the beginning of the sunset. Joshina was buying some items from the Aarti site. After a light dinner from the way back from Triveni Ghat, we went off to the Rishikesh bus stand. In Rishikesh, I missed showing the children the Ram Jhula and Lakshman Jhula bridges. I also missed walking along the banks of the river across the city where Sanyasis and other divine institutions could have been seen. I also wanted to visit the hotel Aloha on the Ganges an image of which you can see below. From Rishikesh, we boarded a bus to Haridwar and from there, after vacating from hotel Sun, headed to the railway station to catch train 12206 / NANDA DEVI EXP at 1 AM to the New Delhi. 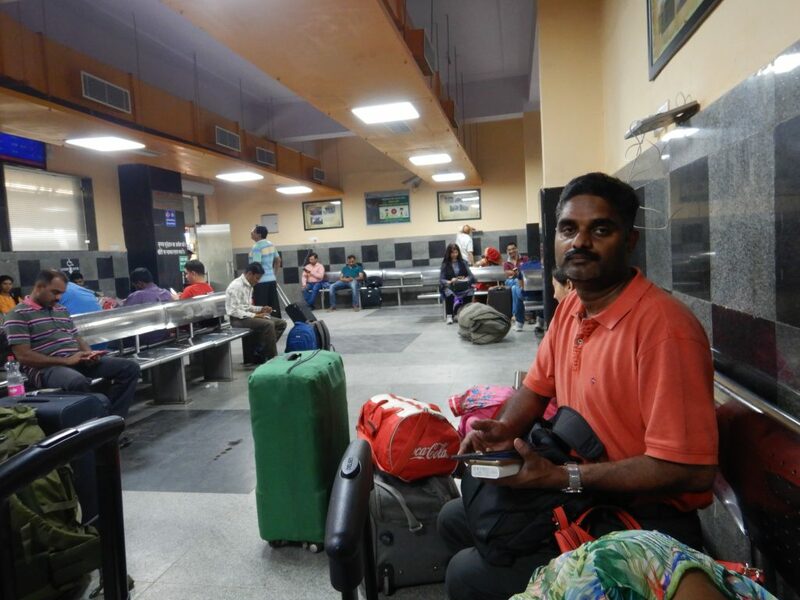 We are now back at Delhi and used the Delhi Railway stations waiting room which was decently maintained to freshen up. Our next trip was about to start at Train No. & Name: 12011/KALKA SHTBDI reaching Chandigarh at 11:05 AM where our driver Bhim whom we travelled with in Shimla would be waiting to take us to Manali which was almost 10 – 12 hours journey by car from Chandigarh.